Some other recent endeavors: For the 2017-2018 school year we created a senior project related to “empathy” for a student at our local high school. Among other things, the senior put together a presentation encouraging empathy that was shown to first year students. (See newspaper article about the empathy project below.) In January 2018, we began a series of “witness trainings” for the public, teaching participants how to respond to acts of bias that they observe. These workshops began after Jamal’s teenage son, who is black, was followed by a car of white youths yelling racial taunts as he walked through the downtown area of a local city (Grass Valley, CA). (The week of the incident, with only a couple of days notice, 1,000 people gathered to do a “love walk” through the city to support the boy and his family.) In advance of the June 2018 primaries, we hosted public meetings with sheriff candidates that focused on racial and social justice issues. Our next big project, planned for MLK Day in 2019, will be a festival honoring all members of our community, and our second annual Love Walk, in Grass Valley. Our mission statement: CCBB is a non-profit organization that provides education and outreach to promote unity through acceptance and celebration of diversity. Our vision: An empowered community that supports and honors diversity. For information add a note to this web site’s “Contact” space. Creating Communities Beyond Bias (CCBB), with considerable support from Peace Lutheran’s Dismantling Racism Task Force, held its first “Unity Summit” on April 30, 2016. The event brought together over 40 representatives of different segments of western Nevada County, California, including community leaders and representatives of groups that normally experience prejudice. Guests included the county librarian, the school district superintendent, the incoming president of Nevada Union High School’s student Social Justice Club, a representative of the Rotary Club, two local police chiefs, members of the Latino community, Native Americans, a representative for illegal immigrants, the director of the local homeless shelter, and others. After an inspiring key note address by Isoke Femi, a consultant and professional facilitator in the area of "unlearning prejudice," small groups brainstormed (1) what problems our community has that contribute to prejudice and prevent more unity; (2) what solutions can be seen; and (3) how can groups and individuals network to create more unity. In the final session, some of the proposed solutions were identified that had the most passion behind them, and people volunteered to work on them over the coming months. Several “task forces” were created. One of them, for example, was the "Library Racial Literacy" group, which hosted a series of community discussions at the county library related to prejudice. Participant feedback was very positive and people felt hopeful. Our 2nd annual Unity Summit on May 6, 2017. Isoke conducted a workshop focused on helping participants overcome what keeps them from being more effective change agents. We also created an opportunity for groups with similar goals meet together in order to find ways to fulfill their common purposes. With contributions from many people, we can create a more inclusive and more loving community. As the lead teacher for Forest Charter School’s Global Studies Academy, I whole-heartedly recommend the programs offered by Creating Communities Beyond Bias (CCBB). For the past two school years we have welcomed CCBB into our high school classroom and they have lead several amazing days of activities that not only pushed students comfort zones but also created an appropriate and safe learning environment. As one might expect the topics addressed by CCBB can be tricky to navigate and everyone in the room including students and teachers bring their own life experiences to the table. While addressing issues of bullying, race, and prejudice the leaders of CCBB continue to impress me with their ability to create trust within a group and make everyone feel safe while talking through these difficult topics. One specific example of this was the Michael Brown case/riots that were unfolding in Ferguson MO during several of their visits to our classroom. The group leaders ability to include this very real political and racially charged current event in their teaching and group discussions made the topics all the more real and relevant to the students. The best testament to the success of CCBB in my classroom over the past two years is how they hooked a previously unmotivated and directionless student. Prior to their visit this student was mediocre in her classes and had no goals for high school or beyond. For sure she was ripe for a change, but the two days she spent working with CCBB were the catalyst for this change. Over the course of two days we saw her become more and more impassioned during discussions and activities, by the end of the two days she was a different student. The following week she started doing all of her school work, and now regularly brings news articles to share with her class, leading the discussions started during the visit by CCBB. She completed the semester with the best grades she has ever had, and now has set her sights on becoming a social justice lawyer. It is for these reasons I feel that any classroom would benefit from as much time with the CCBB as possible each year. The CCBB members professionalism and candor helped create and environment that truly changed my students. In the case of the previously mentioned girl whether or not she ever becomes a lawyer, her passions were ignited by her time with CCBB and her life was forever changed. Her story says so much more about the value of working with Creating Communities Beyond Bias than any number of pages I could write. I believe that if more people were exposed to the ideas addressed in CCBB programs the world would be a better place. They are changing the world one student at a time! I am writing this letter in praise of Bill Drake’s (et al) anti-prejudice education group. It has been my sincerely pleasure to interact with them over the last year-and-one-half, and it is an honor to recommend their work to others. At the time when I first met Mr. Drake, I was teaching a Peace Studies course to high school students at The Woolman Semester School, a Quaker semester program on peace, justice, and sustainability. The course was an exploration of peace, violence, power, privilege, and nonviolent action. For the first semester that I had them come in, I only scheduled 1 class period (of 2 hrs.) for them to conduct their workshop. I immediately regretted not creating more time. The group came into my class very well prepared and immediately set a tone of acceptance and warmth. Over the next two semesters, I had them in for increasing amounts of time. Each experience brought new insight into the depth of their wisdom and the wide range of activities that they were prepared to facilitate. The curriculum fit perfectly within my unit on power, oppression, and privilege. However, each semester there was a different group of students here and so I had the opportunity to see how they would work to modify the activities to fit the precise needs of the group. There was great communication before and after each event where they would ask questions about the group dynamics of the students and any potential challenges they might be facing when presenting. Because of this, I am confident that they have the wisdom and ability to facilitate in education environments that are not as specifically focused on peace and justice studies already. Another strength of their curriculum is that it is very experiential and also personal. The group was quite conscious of how much time was spent in large/small group discussions, storytelling, and physical activities. This, of course, is crucial when working with teens. It is also so important that the issues and concepts were not intellectualized. Instead, each of the facilitators uses their own life and journey through living in a racist world to highlight what they are talking about. Additionally, there are several opportunities for the youth to reflect on their own experiences and come to understand their identities in a new way. The facilitators modeled vulnerability and shared their pieces with humor, which encouraged many of the more timid students to step outside of their comfort zones. If I were still teaching this course, I would continue to have this wonderful group in my classroom. I wholeheartedly recommend them and am happy to answer any further questions. I am writing this letter in behalf of an organization called “Creating Communities Beyond Bias,” that recently presented a workshop for my Psychology of Adjustment class at the Nevada County Campus of Sierra College. I was thoroughly impressed with their work and highly recommend their program to anyone endeavoring to enhance the quality of education for students and/or other faculty members. This particular workshop was facilitated by Bill Drake and Jamal Walker. They guided students through a series of personal and interpersonal processes designed to address the issues of prejudice, discrimination and racism so prevalent in our society today. Not only did Bill and Jamal create a context of mutual support and trust, they also provided an opportunity for students to become aware of, and express, their concerns regarding these issues as they arise in their own personal everyday lives. Again, I would highly recommend offering this workshop as an adjunct to any educational and/or personal growth program that might be available in this community. Their skill in addressing these sensitive issues is clearly reflected in the level of professionalism and expertise they bring into the classroom setting. Like every senior at Nevada Union High School, Xochi Husted recently completed her senior project. As many of her classmates participated in job shadowing or creating works of art, Husted knew she wanted to do something that for her had a deeper meaning. Meanwhile, the local group Creating Communities Beyond Bias was actively looking for seniors who might be interested in pairing with them for their senior projects. The projects are a requirement for all students who wish to walk across the graduation stage with diploma in hand. Creating Communities Beyond Bias was formed in 2011 in response to a racist incident in Nevada County. The last seven years found the group serving on a number of panels related to prejudice, and advising school administrators and student groups concerned about social justice issues. They have conducted numerous workshops and presentations for middle school, high school, and college students in the region. When the group visited Nevada Union to seek likeminded seniors interested in working with them, Husted was the lone applicant. "I didn't know what to expect," she said. "And I think that's how a lot of other seniors felt. I thought well, it sounds like something I would like, and sounds like an organization I could identify with." With her mentor Jenny Hale and Creating Communities Beyond Bias' Bill Drake guiding her, Husted set off on her project to make Nevada Union a more empathetic place. "My specific thesis was educating students about empathy. We could increase empathy and therefore solve a variety of social justice and bullying issues plaguing the nation," she said. "I found that empathy education is effective and the exposure to the idea of empathy, the definition of empathy, the concept of empathy can change a child's behavior and change how they view other children's behavior. It helped me and motivated me with my project." The process of completing the project entailed the fulfillment of a number of requirements, such as creating a slide show and dedicating at least 20 hours to her research. Husted interviewed students, sent out a school-wide survey, and incorporated all of her data into her project and final presentation. She also presented her findings to freshmen at her school, a group she believes are more impressionable as they are new to high school life. "I feel like freshmen kind of tune out when they're bored so I wanted them to see that it wasn't just coming from me," said Husted. "I just worked on defining empathy, showing how you can use it in your daily life, and what happens when you are less empathetic." Those who lack empathy, Husted found, have a higher likelihood of committing a violent crime, and a predisposition for antisocial tendencies. Antisocial personality disorder is common when one experiences low levels of empathy. Activism comes naturally for Husted, as she is a member of the Social Justice Club at Nevada Union and would like to go into law or policy when she enters Pitzer College in the fall. "I love education, I love that as a way of giving to people. I am definitely activism-oriented," she said. Of her own school, Husted said, "Recently we had a student who had some negative things said to him because of his sexual orientation, so he enlisted the social justice club. There was a student last year and she had some problems with hate speech because of the color of her skin." "I know that there is a culture on campus that accepts that type of behavior, but I also know there's a culture on campus that doesn't." Good news came when Husted learned she had received a grade of 99.4 percent on her project. One of the judges on the panel declared that Husted's project was the best she had seen in three years, which gave Husted hope that Nevada Union is ready to examine empathy more in the future. "I was hoping that by educating this newer generation they could set an example for the classes that are coming later," she said. "I hope I had an effect on the way they behave. I am hopeful that there will be a change." Husted said that the project has left an indelible mark on her. "I noticed a change in the way that I think about my future," she said. "The project did have an effect on me. It pushed me more toward my activism. I want to open people's eyes." The 32 high school students at Forest Charter School lined up at one end of the blacktop outside a set of portable classrooms on campus. “If you were raised in a working class home, walk across,” said Jamal Walker. Twenty-seven students walked to the other side of the blacktop and turned to face the rest of the group for a moment before heading back to join them again. Walker continued with about 20 other directives, asking students to cross the blacktop if they had ever been called fat, had Native American heritage or had ever struggled in school, among others. “Take a look around, notice who’s with you and who’s not,” Walker would remind the students after every couple of trips across the pavement. The students were participating in the power shuffle, an exercise designed to demonstrate that everyone falls into different social categories that give them power or take power away. The power shuffle helps students recognize those divisions, spot commonalities and confront stereotypes, Walker explained later. The exercise was one of several designed to guide conversations about race, ethnicity, prejudice and conflict resolution among students during two three-hour workshops held Nov. 9 and 16 at Forest Charter. The workshops were facilitated by Walker, Bill Drake and Cindy SantaCruiz-Reed, who co-founded Creating Communities Beyond Bias, a group dedicated to helping youth develop tools to overcome and unlearn prejudice. “We’re encouraging them to think critically, and for some of these students, they don’t get to have that kind of interaction and that kind of teaching on a regular basis, someone actively engaging them and saying, ‘We want to hear from you, we want to know what you think about this stuff,’” Walker said. Creating Communities Beyond Bias formed about four years ago. Drake works in customer service at BriarPatch Co-Op and has a unique perspective on overcoming prejudice after growing up in the segregated South in a family that believed in white supremacy. He eventually rejected those beliefs and has become an activist fighting for equality; he chronicled those efforts in his book “Almost Hereditary: A White Southerner’s Journey Out of Racism,” which was published in 2014. In 2011, an article on The Union’s opinion page about a racist incident that had occurred in Condon Park struck a chord with Drake. He began talking to Walker, who was then his co-worker at BriarPatch and who is now a cook and baker at Summer Thyme’s Bakery & Deli. “The two of us decided we wanted to create something in our county to try to create more unity and less prejudice,” Drake said. SantaCruiz-Reed joined their efforts in April 2012. Over the past couple of years, the group has given presentations and conducted workshops at several county schools, including Nevada Union High School, Lyman Gilmore Middle School and John Woolman School in Nevada City. 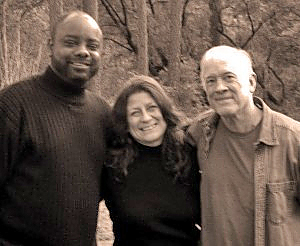 Each member of the group brings a unique perspective and background that they share with the students — Drake, a white man with experience overcoming ingrained racism; Walker, an African-American man with a background in social justice work; and SantaCruiz-Reed, who is part Latina and teaches human development at Sierra College. And though their workshops are grounded in racial issues, they also address sexism, homophobia, class issues and restorative justice, among other topics. This is the third year the group has held workshops at Forest Charter, working with 9-12 grade students who are part of the school’s Global Studies Academy taught by Jennifer Homan and Josh Miller. The workshops were a “really good fit” to continue some of the discussions about race relations, social justice and poverty that students have within the school’s global studies program, Miller said — discussions that encourage them to think critically and become active citizens in the community. “All these things are pieces of the bigger world around them,” Miller said. Tanner Day, a sophomore at Forest Charter, called the workshops “eye-opening.” He said it was especially inspiring to hear Drake, Walker and SantaCruiz-Reed talk about their personal experiences with racism. He likened their experiences with prejudice to carrying a heavy backpack on their shoulders, and said it inspired him to think about his own experiences with injustice. It can be challenging to have the types of conversations Drake, Walker and SantaCruiz-Reed were facilitating, said junior Ohmala Kotok — but they’re important conversations to have. “The more people are aware (of prejudice), the bigger shift we’re going to make in a positive direction,” she said. Senior Georgia Cutters said the workshops helped her realize that everyone has biases. “We’re not bad people for having them, but we need to acknowledge them,” she said. It’s that kind of awareness that Creating Communities Beyond Bias hopes their efforts will inspire. “If it just plants some little seeds and they’re more aware, they become more aware of their own prejudices and maybe down the road they look at prejudice around them and in the world, and they find a way to make it a little less,” Drake said. The group plans to continue its work in schools, and are also assembling a summit in the spring that will include representatives from law enforcement, education, religious institutions and other areas of the community to address and reduce prejudice in Nevada County. It’s a conversation that’s too important to avoid, Walker said. JAMAL WALKER: My name is Jamal Walker. I am a 46-year-old black man, and my love for social justice work began as a youth. At age 17, I was introduced to an organization called “New Bridges” at one of their week-long youth camps designed to assist young people in dealing with issues of social and cultural oppression. The experience was transformative, and I continued to work with this organization for several more years. I have traveled to several states in the U.S., facilitating large groups on such matters as race, culture, class, and sexual orientation, as well as other social issues. Currently, I am working towards rebuilding and reinvigorating the New Bridges model and working with other socially aware groups both inside and outside of Nevada County, California. What I bring to this work is a soulful and creative expressiveness, with a focus on touching the innermost parts of ourselves which seek to hide from us our hurts, indoctrination, and contradictions, which make us completely human, yet also impede our progress as agents of social change. I attempt to bring in my own transparency as a flawed human being, hopefully giving others permission to do the same. CINDY SANTA CRUZ-REED: I have my MA in Human Development with a social justice focus from Pacific Oaks College. I was born into a multi-ethnic family that only acknowledged our white heritage, so I have spent my life learning about my own and other cultures. I was raised in Los Angeles. I am a member of Concerned Educators Allied for Safe Environments and Non-Violence in the Lives of Children. I have been trained to help college students and early educators understand and address the effects of violence on our families, realize the importance of peace education and social justice, and become change agents in their communities. I have also worked with infants, toddlers, preschoolers, adolescents, and adults through family resource centers, child development centers, and parenting classes. I also helped develop and run a Nevada County, California Peace Camp, and ran the California Association for the Education of Young Children’s Center for Social Change for five years. I currently teach human development at Sierra College and provide family services through Helping Hands Nurturing Center. I love to address the real issues that people face today. BILL DRAKE: I was born into a white racist family in the South in 1945, when segregation was the law of the land. My mother was from Mississippi. Three generations of my ancestors owned slave plantations. My great-grandfather was a Civil War hero who, as a Mississippi state senator, helped create the Jim Crow era, during which Southern blacks were oppressed for almost a century. As a youth, I was taught racist beliefs and committed racist acts . When I was 17, I had an experience which caused my white supremacist beliefs to unravel, and my lifelong quest to healing my own racism began. As an adult, I have written articles and done radio programming related to civil rights and racism. As well as doing public presentations and co-facilitating workshops for student groups, I have done power point presentations for classes related to racism and Civil Rights, drawing on personal experiences and my family history. In 2014, I published the book Almost Hereditary: A White Southerner’s Journey Out of Racism, A Guide for Unlearning and Healing Prejudice. My having held white supremacist beliefs and then rejecting them is an asset when working with students, especially those who are white. I can speak of both sides of racism (believing in racism/rejecting racism) and can address issues many white students deal with, such as white privilege, guilt, and shame. My greatest strengths include my story and my awareness of my own conditioned racism. SANDY KEWMAN: I am a fourth-generation European-American with great grandparents from Germany, Poland, Netherlands, France and Luxembourg. I was raised in central Minnesota, where all our neighbors came from a heritage similar to that of my family. I met people of color who were professors as well as students when I went to college. I met Dr. Vincent Harding in July of 2013 and heard him say, “We are still seeking a more perfect union,” and that there is much work to be done to make this country a democracy for all. I want to live the rest of my life paying attention and working for such a union.